02. For each pass, a photograph must be submitted showing the applicant, with his/her vehicle at the summit point to prove the pass was driven, ridden, walked or run. We will pick up the date and other information from the properties of the photos for verification purposes. 04. The name of each successful person will be published on this page, in numerical sequence and shall remain on the page in perpetuity. 05. Respect nature and private property and close all farm gates once you have passed through. 06. Every participant needs to understand that there is an element of danger in this challenge and depending on weather conditions, could be life threatening. Take emergency equipment with you and for cyclists, walkers and runners, adequate back-up and medical care. 07. The passes may be driven in any order. 08. Review each pass thoroughly on this website before setting off on the challenge and ensure your vehicle is serviced and properly equipped to deal with the rigours of off-road driving. All the passes are gravel or two spoor jeep track, except for the Barkly Pass which is tarred. 09. No entry will be accepted without entering online on the appropriate form which includes an indemnity form. 10. Please complete the challenge in a sportsmanlike spirit with ethics and honesty being the foundation of what it’s all about. Remember this is not a race. There will be no rewards for anyone racing the passes. 11. In the specific case of the Ben MacDhui Pass, please note that in mid-winter when the ski slope is covered in snow, vehicles are not allowed to drive over the ski slope. Tiffindell have graded an alternative access road onto the pass that avoids the ski-slope. Please make use of this option when there is snow around. If conditions are too difficult to go up the pass by motorcycle or 4x4, then entrants may elect to walk up the pass and we will still validate your result accordingly (with a photo at the summit beacon). 12. 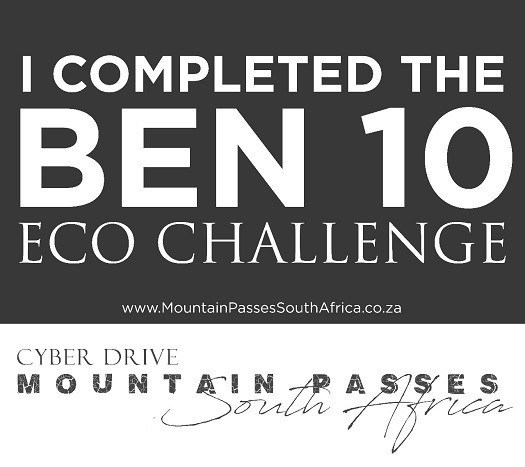 A TREND HAS DEVELOPED TOWARDS THE END OF 2018 WHERE (ESPECIALLY) MOTORCYCLISTS GO AND RIDE THE BEN 10 WITHOUT FIRST REGISTERING. THE PROOF OF COMPLETION IS THEN SENT IN TO US WITH THE ENTRY FORM, AFTER THE FACT. AS FROM JANUARY 2019 WILL NO LONGER PUBLISH FINISHING RESULTS FOR ANYONE WHO HAS NOT FIRST PRE REGISTERED. WE OFFER THIS SERVICE FREE TO EVERYONE. PLEASE AT LEAST COMPLY WITH THE BASIC REQUIREMENTS. THE MAIN REASON WE REQUIRE YOU TO PRE ENTER IS THAT ALL THE LEGAL STUFF (INDEMNITY) IS IN PLACE. THANK YOU FOR YOUR COOPERATION. 15. Every pass must be driven completely. In other words, the full length including the ascent and descent. For example, you cant drive up Naude's Nek and then turn off to do the TTT at Naude's Nek viewsite, as that is only a portion of the pass completed. You must plan your route so that every pass is completed from end to end according the GPS coordinates as stated on this website. The three passes most commonly that fall foul of this rule are 1.Naude's Nek 2.Lundeans Nek 3.Jouberts Pass. We can't stop you taking short cuts, but we do expect every entrant to act ethically.